The other day I took Mia and Zoe to participate in a research study at the University of Arizona. Personally I love to say that the girls were in an experiment but my husband thinks that makes them sound like lab rats. I also think it’s hilarious on the days of the study to say that the girls are going to college because they need to work on their research project. I know, I’m a dork. 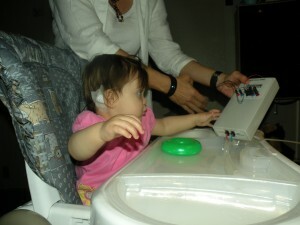 Mia checking her brain waves during a hearing study. This most recent study dealt with language development and was pretty interesting. One at a time I took the girls into a room where they sat in a little chair infront of a computer screen and next to the grad student running it. There was a camera to film it all and a seat for me out of the way. The researcher pulled out a puppet named “Sheepy.” Sheepy had trouble pronouncing words and it was the girls’ job to help her. Together they looked at pictures of animals on the screen–a dog, cat, bear, etc. If Sheepy said the name correctly they gave her a little plastic treat and if she said it wrong they gave her a black rag that she coughed on which the girls thought was funny. After the familiarization round they then learned completely new animals. These were ones created by the researchers that appeared on the screen multiple times teaching the girls and Sheepy the made up names. After that Sheepy was quizzed on the new names just like before with the girls deciding if she said it correctly. Finally, after a brief break, the girls were quizzed themselves naming pictures on the screen. For all their hard work they each received a certificate and a toy (both chose a little pony). This was by no means our first study. The first time we went the girls were about four months old. Since then we have made over 20 such visits. Many have been performed at the same lab or their sister lab with the girls returning as they reach different age ranges. One required multiple visits over the course of six months. Another included a home visit. The girls usually receive a book or toy, occasionally monetary compensation. Still that’s a lot of effort for a board book and not why I do sign us up at all. So, why? 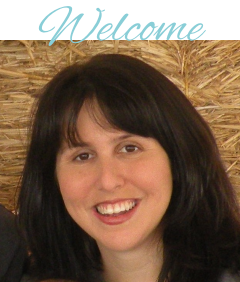 To be perfectly honest, the first time I did it becuase it was some place that seemed to welcome newborn twins and I needed to get out of the house. 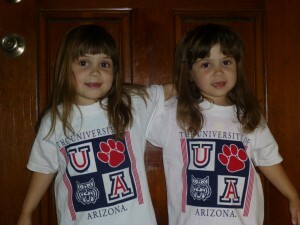 But the main reason we kept going is because I love exposing the girls to higher education. I love that college (and the University of Arizona) is already part of their vocabulary. I want my children to be lifelong learners and value education–exposing them to the university and research early on supports that goal. I also learn more about my own children. This is a different environment with activities different than what we do at home. I like seeing how the girls respond and it helps me pick up on subtle differences in how the two learn. For instance, in this latest study, I was able to see that Zoe is a little more verbal, repeating the names of each animal even though she didn’t need to, whereas Mia is a little more careful, trying to check her answers with the researcher. And it’s interesting. I think the studies are neat to see. One time I was reading a book that referred to studies going on that we had been a part of and I just kept thinking “How cool is that?” I find brain development fascinating (just check out some of the books on my booklist). Babies are so little that it’s amazing what they can do. For instance, did you know that babies understand the laws of physics? 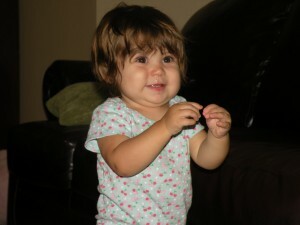 When shown magic tricks, things that appeared to violate the laws of physics, babies were surprised. They were shown a block floating in midair, objects that disappear and reappear somewhere else, and a box placed behind a screen that had disappeared when the screen fell back. Babies will look longer at the magic tricks than they did at the similar scenes that followed physical laws. They know that what they are seeing is not right. And did you know that babies can do basic math? 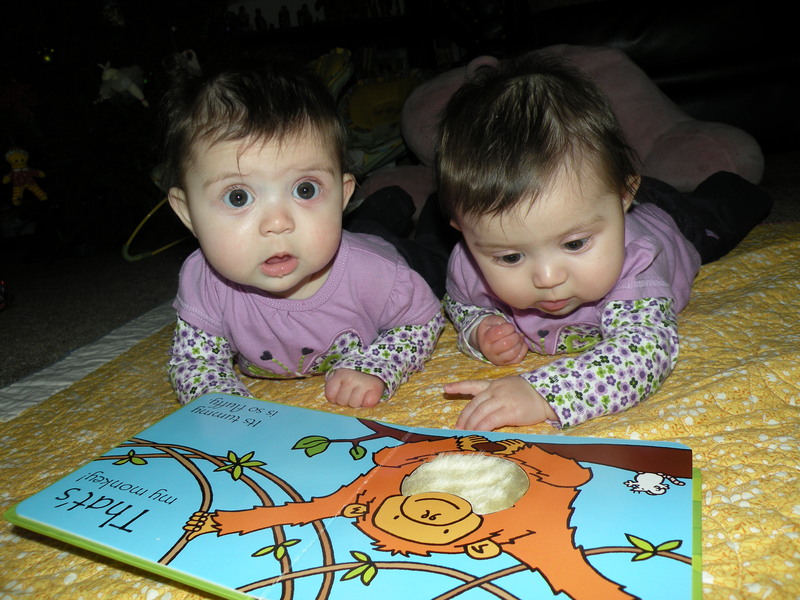 When they watch one doll placed behind a screen and then a second doll placed behind the screen, five-month-old babies were surprised to see one or three dolls when the screen dropped. They knew it was not right. Baby studies have also shown us how compassionate they can be. Babies respond more to the cries of other babies than to a recording of their own crying. And starting at about one year old, they will try to soothe others who appear in distress by patting them or handing over a bottle or toy. Babies can tell right from wrong. In one study nine- and twelve-month-olds were shown movies of geometrical characters interacting with one another. In one, a red ball would try to go up a hill. Sometimes a yellow square would try to help the ball up the hill and other times a green triangle would try to push the ball down. Afterwards when the ball approached the hindering triangle the babies were surprised and looked longer than when the ball went over to the helpful square. Later babies were shown the same scenario but with puppets. Afterwards the puppets were brought over to the babies, almost all of whom picked up the helpful square. Similar studies have even shown that in addition to telling right from wrong, babies will reward the good guy and punish the bad. They also prefer others who reward the good or punish the bad. There are also studies with more immediate practical applications. For seven months we made regular visits to the Speech, Language, and Hearing Sciences department that included observing how the girls respond to certain sounds and measuring their brain waves while tones were played. Researchers are studying infants with normal hearing in order to develop methods to identify and help infants with hearing loss. Results from studies like this will help doctors develop a hearing test for babies and will tell us if their hearing aids are working. I’m sure you are thinking, “That’s cool for you, but how do we do that?” Okay, maybe you aren’t. But if you are, I recommend contacting your local college or university. Most of our studies have been done through the psychology department, specifically the child cognitive lab. 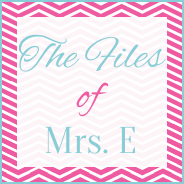 Once you get on one list, you usually can be contacted by other departments and labs as well. It also helps to just keep your ear out. Maybe friends are already participating (I’m also telling people they should sign up) or ads are listed with your local parenting group. We actually had paperwork included in our packet when the girls were born asking if we wanted to be put on a contact list. That’s how they first found us. But when we did the first study we again filled out paperwork where we could initial that other studies could contact us. 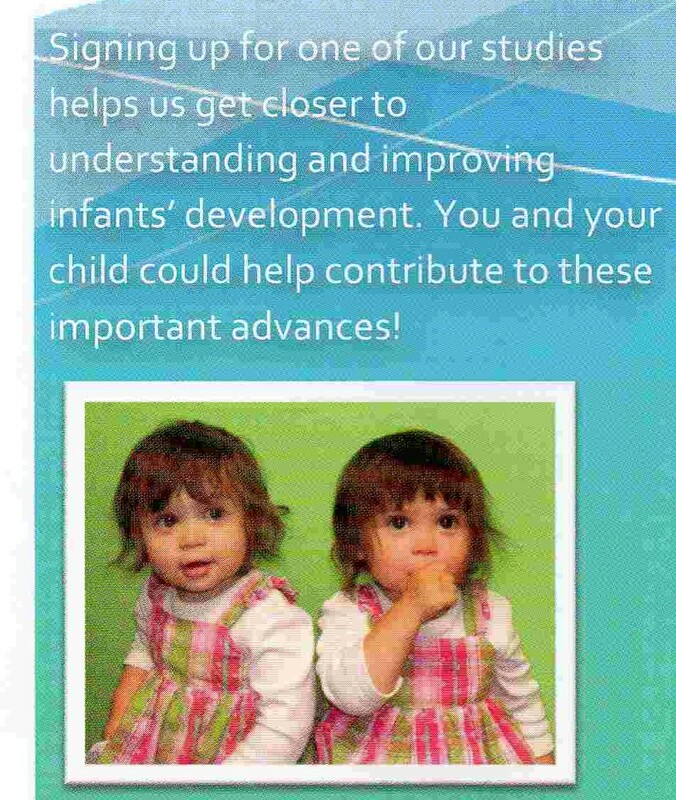 My girls in a brochure for one of the labs we’ve attended. 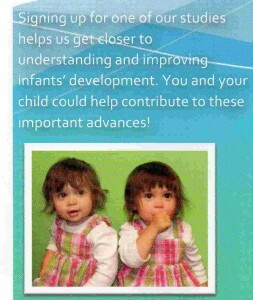 I was such a proud mama when I saw their picture in it. I don’t know if the studies my daughters participate in will produce breakthrough results but I like that they are contributing to science and human understanding. And I like that my children are being exposed to higher education and to people dedicated to learning since I want learning to always be a part of their lives. I know that these studies won’t make my children any smarter, but, from what I hear, babies are already pretty smart.